It’s the little things that sometimes spark big questions. Transitioning into a new hospital is no easy feat and daily tasks can have a huge impact. One may think that a robust design process would account for everything that impacts team efficiency and satisfaction, but that’s often not the case. There are hundreds of minute details to address: dozens of employees need to clock in and out during shift changes, the re-allocation of funds affects staffing and building design impacts the ability to transport patients in need of multiple services. The list is endless. My first relocation experience was in nursing school. I was working as a patient care technician at a large pediatric academic medical center. Every unit was impacted by the relocation into the new patient care tower as new cohorts of patient populations based on clinical issues as opposed to age were created. For example, the unit that exclusively cared for infants no longer existed, so all units were expected to meet their needs. Entire clinical teams were disrupted as team members dispersed into new units; I still remember the disorientation and stress that ensued. At one point, the hospital purchased state-of-the-art boom technology designed to replace free-standing devices at the bedside, such as ventilators. The intent was to eliminate traditional headwalls, consolidate medical equipment and free up space for visitors and families. A large portion of our intensive care patients required diagnostic procedures outside of their rooms for extended periods of time, and their ventilators were expected to accompany them. Imagine the frustration of a patient who needed to go in for a procedure, but the ventilators were no longer mobile. Staff had to quickly decide next steps to ensure the patient received appropriate care. I later assumed a broader leadership role as the organization grew. I became responsible for both the design and transition into several new clinical spaces. Over a period of five years, the intensive care units alone transitioned three times. Each time, we learned something new and were able to improve. A key lesson: invest more time engaging staff about their life in the new space to help alleviate unanticipated stress. Over the last 12 years, the Transition Planning team at CallisonRTKL has helped more than 25 healthcare organizations from more than 10 different states. From projects with as few as one clinical department with 18 beds to whole replacement hospital projects with more than 70 departments and close to 400 beds, they all share common prerequisites for success. Among these, management of expectations and response to change is key. 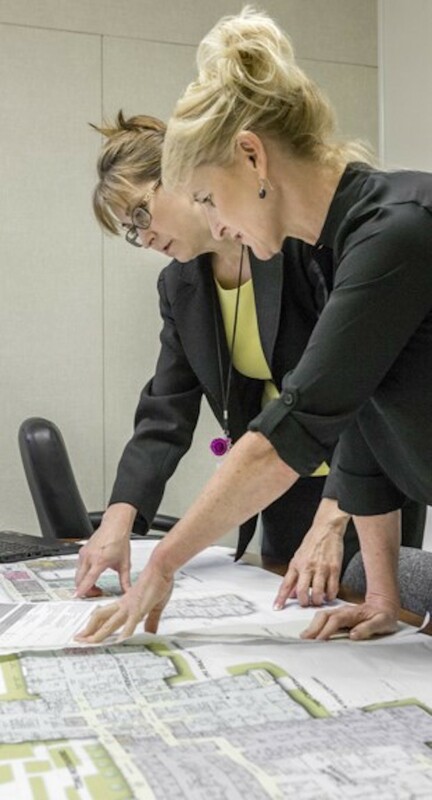 Our team of seasoned clinicians, certified project managers, and expert change management coaches support our clients through a systematic occupancy planning process. It’s designed to identify and validate how patient, visitor, and supply flow and service delivery will work in relation to the new space, including the determination of processes that need to change to align with the building design. Our coaching model is founded on change management research and operational experience, which allows us to equip staff and patients with the necessary tools for a transition. Our goal is to aid teams in proactive planning, as opposed to retrospective design change. “The walls are the walls, learn to love,” this is the basic mantra of occupancy planning. It’s always best to begin with an employee’s first moments at work: where they park, enter the building, store their things and all other daily details. Once we smooth out the bumps, we move to patient flow in the new space. Is the organization embracing a “back of the house, front of the house” philosophy in the new design, and how will that impact movement of patients and services on and off the unit? The list of questions we go through during occupancy planning allows for design flaws to be addressed ahead of time. Also, anytime new processes can be implemented in a current space, the “new normal” is created before the actual move. After years of planning and months of construction, ensuring things run smoothly on move-in day is key. One of our clients recently shared with us that they felt the move was the easy part; it’s surviving and thriving in the new space that’s the challenge. In my clinical experience and now on the other side of the business, I’ve found that investing in occupancy planning ahead of time helps teams find and resolve the little details before they become big hurdles.